This online assessment makes dealing with conflict better than ever, with expanded reports and graphs this instrument is more effective, easier to use and easier to administer. Graphs of the participants results in the five conflict styles and includes a percentile comparison of the participants scores to the scores of the general population. 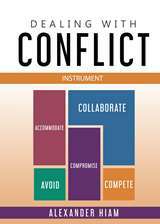 A guide to conflict handling styles that outlines the implications of the participant’s scores across all five conflict styles. A detailed skill building section on the use of the collaborative style, which is the preferred style for more business situations. An explanation of conflict IQ and how to improve your conflict IQ. The effect of conflict on employee motivation. The Conflict Situation Selector exercise, which is a separate assessment activity to teach participants how to select the optimal conflict style for every situation. Trainers/administrators appreciate the ease of use and control provided with the online assessment administration system. The trainer can control if the participant can access their report, modify email notifications, and download group raw data for additional analysis. Participants simply complete the assessment by clicking a link provided by an email invitation to participate in the online assessment process. For self-directed learning applications, participants can immediately access their reports.